Stress is a part of our daily lives. This is something that we have learnt to accept and live with. Stress, both, physical and mental, have been proven to initiate changes in blood sugar levels. When stress increases, sugar levels in the blood increase. This is the body’s way to boost the energy available to cells, for, literally, fight or flight. However, this could prove to be a problem for diabetics. Learning how to manage your stress goes a long way in helping you keep your sugar levels stable. 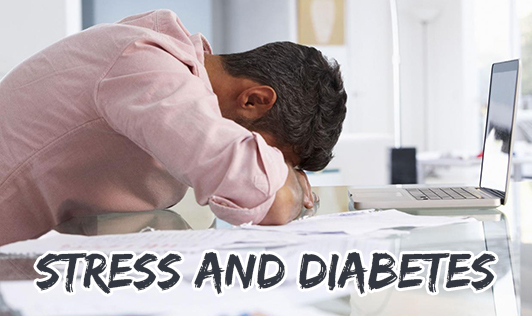 It may seem like a vicious circle, as living with diabetes could cause an increased amount of stress. Maintain an exercise regime. Just 30 minutes of daily exercise could help you lower your blood sugar levels and alleviate stress at the same time. Do not “stress eat”. It’s a natural reaction to reach for comfort foods such as chips or chocolates when stressed. Choose a healthier alternative such as salad sticks or yoghurt instead. Learn to identify your stressors. Maintain a stress journal to help you figure what triggered the increased sugar level. We often don’t co-relate the two. Try Progressive Muscle Relaxation techniques coupled with deep breathing. This will help you calm down and also helps to reduce blood sugar levels. Try and step back from an upsetting situation. Calm yourself down before reacting or responding. Remove caffeine from your diet. Start with cutting back on the coffee, one cup at a time. Cultivate positive thinking. Start by replacing the negative thoughts with positive ones. Don’t be harsh on yourself if you cannot do it all the time. Learning a new way to think is going to take time. Persevere and you will succeed!